Home > Guides > What is Form 16? Income Tax Form 16 is a certificate issued by an Employer to his/her Employee showing the details of salary and tax deducted thereon. TDS provisions in the hand of an employee become applicable only when the income from salary paid to such employee exceeds taxable limit. Therefore, the liability to issue Form 16 arises on an employer only when he deducts tax at source on the salary paid to an employee. Form 16 is issued on annual basis and an employer can download it by 31st May of next financial year (e.g. till 31st May, 2016 for salary pertaining to F.Y. 2015-16). What if Employer does not provide you Form-16? If an employer does not issue the Form 16, it does not relief the employee from filing income tax return. Although, an employer is compulsorily required to issue this certificate, but if he has not done so, the employee must file its return taking income from all the sources and also claiming the TDS amount which has been deducted by the employer. In case of a job change, an individual must collect Form-16, if any, from his all employers and take account of all the Form 16 pertaining to the same financial year at the time of filing his income tax return. He must also disclose and furnish every relevant information related to his salary paid and tax deducted thereon to his new employer so that the correct income and deductions are shown in the TDS certificate provided by the new employer. Form 16 is the documentary evidence stating that the employer has deducted tax on salary thus letting an employee to claim correct amount of TDS. It provides all the details necessary to file the return as was disclosed to the employer. Any other income or deduction which the Form 16 is not carrying must be shown in the return. Form 16, being the proof of the income earned throughout the year, assists at the time of applying for the loan. Form no. 16 is divided into two parts - Part A and Part B. Part A of Form 16 contains various details of the Employer and the Employee like TAN & PAN of the employer, PAN of the employee, their addresses etc. It also contains the details of the amount paid/credited and the Tax Deducted at Source by the employer thereon in respect of such Employee. 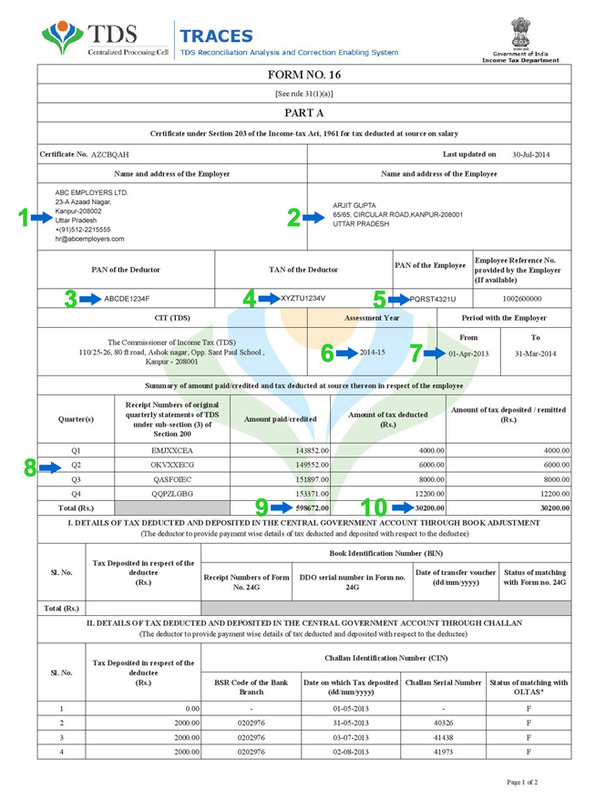 Part B of Form 16 contains consolidated details of the salary paid, information about various income that collectively form your Gross Total Income, various tax benefits, total income, tax on it, etc. Let us discuss them in an elaborative manner. 1 Name & address of the Employer Refer here to check the name and address of the Employer. Ensure that it is stated correctly because the same shall be used while filing your Income Tax Return. 2 Name & address of Employee Find the name & address of the Employee on whose name Form 16 has been issued. Make sure to enter it correctly, otherwise it will create a problem for refund, if any. 3 PAN of Deductor Refer point 3 to find out the PAN of the Deductor who is your Employer. 4 TAN of Deductor Point 4 reflects the TAN of Deductor. It means the Tax Deduction Account Number of the Employer. It is one of the most important components of Form 16. You must ensure that the TAN quoted in Form 16 is correct. Because, in case the TAN quoted is incorrect, you would be in real trouble while filing Income Tax Return. You may not be able to claim the Tax Deducted at Source by the Employer. 5 PAN of Employee With reference to point 5, locate the PAN of Employee. You must ensure that your Employer in Form 16 has correctly stated PAN number. They may cross check it from their PAN card. 6 Assessment Year Assessment Year is the year in which the income earned by an Individual in the previous financial year is assessed. For example, Form 16 for the assessment year 2015-16 means that the income is of the previous financial year, 2014-15. 7 Period with the Employer Refer here to determine the period for which Form 16 is issued. was deducted It shows different quarters for which tax was deducted. 9 Amount of Salary paid in different quarters This field reflects the amount of Salary paid in different quarters by your Employer. different quarters This field shows amount of Tax deducted in different quarters by your Employer. 11 Tax deposited in respect of the deductor It shows the particulars of the Tax payment that has been deducted by the Employer to the Central Government like Challan number, BSR code of the Bank, Branch name, and the Date of Deposit. 12 Verification The deductor here certifies that the information given in the Form-16 is true and correct. Part B shows the Gross Salary that an Employee is entitled. 11 Gross Salary Gross Salary is the aggregate of Salary, value of perquisites, and profits in lieu of Salary. 11a Salary Salary includes Basic Salary, House Rent Allowance, Dearness Allowance, Leave Encashment, and Gratuity. 11b Perquisites Perquisites are the value of benefits or facilities provided by the Employer to the Employee, either free of cost or at concessional rate such as Rent free Accommodation, Value of Vehicles provided, etc. 11c Profits in lieu of salary Payments received by the Employee in addition to Salary. 12 Deductions Deductions such as Entertainment Allowance and Tax on Employment. Head "Salary" After deducting the Deductions mentioned above, you will get the income chargeable under the head "salaries" which is reported in pointer 13. 14 Other Income Other sources of income as reported by the Employee like income from House Property or income from Other Sources (pointer no. 14). 16 Deductions Under Section 80C, 80CCC, 80CCD These are various tax benefits under Sections 80C, 80CCC, 80E, 80G and 80CCD that are allowed as a deduction from the Gross Total Income. 17 Other Section / Deductions like 80E, 80G etc. All other Deductions excluding Section 80C is reported here. 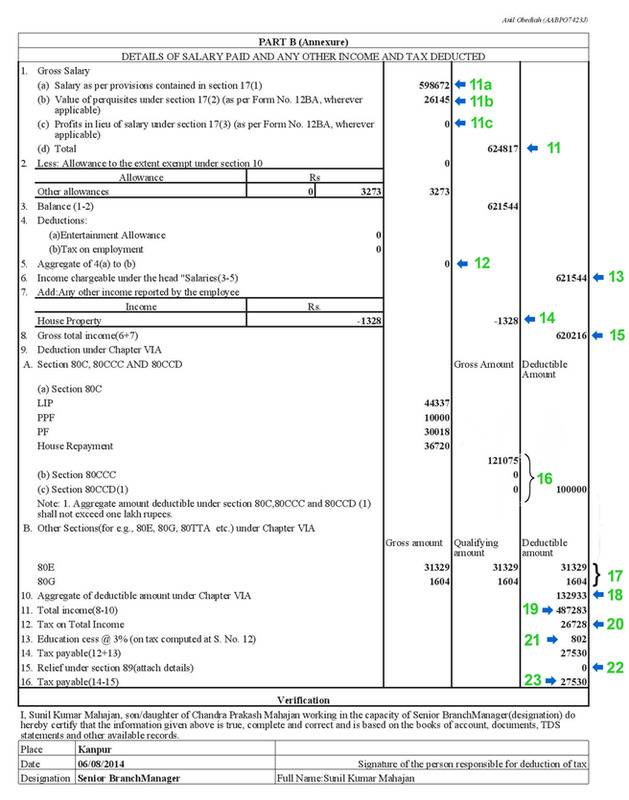 18 Aggregate of deductible amount under Chapter VI Sum total of Deductions / Tax Benefits allowed to a Tax Payer. 19 Total Income Income after subtracting the aggregate Deductions. 21 Education Cess Education Cess calculated at 3% on the Tax payable by the Payer. 22 Relief Under Section 89 Relief granted by the Government under the Section 89. You must attach details with the form to avail the relief. 23 Tax Payable Final Tax payable by the payer, which includes the tax on Income and Education Cess on it. Read our guide - How to e-File Income Tax Return to quickly efile Income tax return with your Form 16. If you don’t have a Form 16, you can still efile ITR. For that refer our guide How to e-File without Form-16 now. gets prepared in few seconds.